demanded the whereabouts of the father of Nnamdi Kanu, the traditional ruler of Afaraukwu Autonomous Community, HRH Eze Israel Kanu. The traditional rulers are asking for a panel of inquiry to investigate the role of the Nigerian Army in the invasion of Eze Kanu’s home. Nnamdi Kanu is the leader of the Indigenous People of Biafra, IPOB. The Okwulaga Enyiukwu and Isiama autonomous communities had petitioned President Muhammadu Buhari, claiming they had yet to see HRH Kanu; his wife, Lolo Sally; and some of his subjects after his palace was raided on September 14 by the army. The monarchs claimed in the petition, made available to journalists in Umuahia on Tuesday, that some members of the community were still missing since the military raid, heightening fears that they might have been killed and their bodies taken away by the invaders along with the IPOB members. 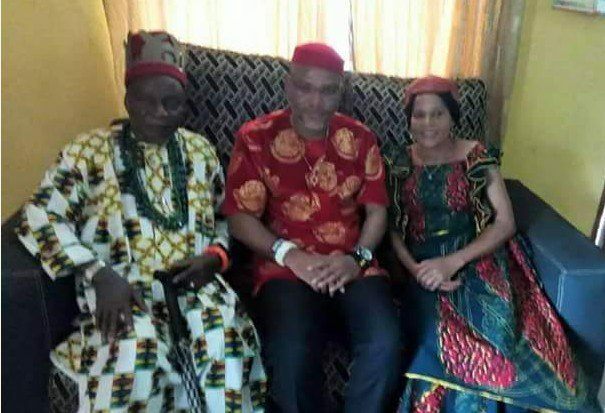 The petition partly read, “That since September 14, 2017 the whereabouts of one of our traditional ruler, HRH Eze I. O. Kanu, and members of his family, including some members of Isiama Afaraukwu community, are still unknown.